Madison talked me into buying her a bird. See this little nest.. It's their home sweet home.. They feather it up often. And I thought I moved around furniture!.. I peeped into the nest to check on our two babes in waiting. There was not two... It was three! Then four... five.. six... seven... Yes! We have seven eggs now to count and watch. Thank you nice pet store man.... These birds really know how to feather a nest. Anyone care for a bird? You know they come in pairs, smiles... We are blessed! LOL Sweet! 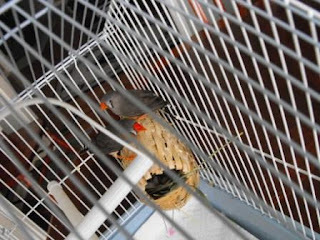 Years ago when we were first married we had a bird. They are so much fun to watch and you have a pair! Double the fun! Has your daughter named them yet? I say you definitely got your money's worth! 7 eggs? Wow! This will be a definite adventure!! How cool is that?!?! They are so cute...what kind of birds are they? 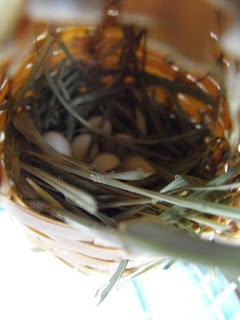 There is going to be lot of chirping when those babies hatch. Oh my goodness! What will you do with 9 birds? But they are awfully pretty. That last picture of the nest is beautiful. You should frame it! That is too funny. They are too cute. 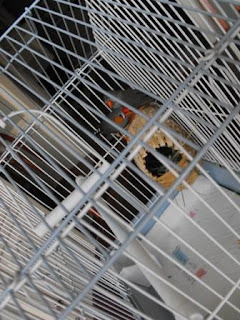 We have done the inside bird thing and didn't fare to well. We know have outdoor chickens. They pretty much take care of themselves with just a little feeding. 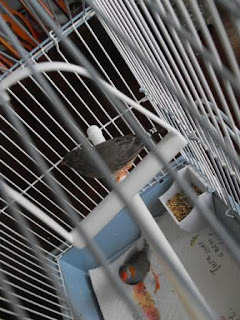 Zebra finches!! (I think that's what they are!) I used to have pair years and years ago. I named them Peep and Tom. ha ha Peep laid quite a few eggs too. But from what I remember not a whole lot of them ever hatched. The sure peep'd a lot though. Oh the noise! Enjoy your birds!! How beautiful! Those little birdies are lucky to have someone who cares for them. So cute Susan. I love things like this. It makes me very happy to watch nature and how it all works. We have a little nest going on that we can watch the progress of. So precious. It teaches me so much about taking care of something. And also the dedication they have to the feathering and feeding of their little birdies. Your birds are too cute. I see a Yorkie tassel that i just may have to buy. That is a lot of birds - good luck with that! They are really pretty though!! So sweet! I love birds, they have been some of our best pets! What will you do with all those babies? 7??? Wow! I bet it will be fun to watch them hatch out and grow. But they're going to fill up that cage fast! Hi Susie! I'm back from your etsy shop and I see you have another crown tassle which I think I must have. Can you tell me the color of the ribbon? I can't tell if it's gray or blue or what. Also, would it be possible for you to wait a while to mail it to me if I buy it? I'm going to be gone again next week and I don't want it to arive while I'm away. That sounds toooo familiar...my husband wanted two doves a few years ago...we ended up with...gulp...17! Yes, 17 birds. ALL IN MY HOUSE!!! 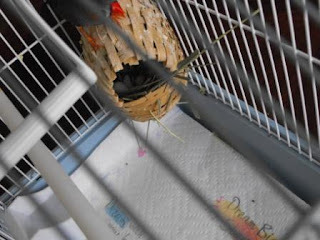 He had to build a custom aviary thing until I finally had enough and kicked them out the door. Well, not exactly, but the bird dander was giving my allergies FITS so I begged him to take them out. They had been in the home office that I was in every day. He took them out to the shop, but left the door open so they wouldn't get too hot. Then a racoon got some of them and some of them got salmonella (or something or other) until there were none. I sort of felt guilty, but only for a little while. My sinuses couldn't handle any more! We were told that if we didn't want babies to just take the eggs out as soon as we saw them in the nest. I don't want to think what that means, but we never did it, obviously. My kids would love it. You are the worlds BEST mom! Hi, I found my way here through the talented Joy. The birds are so cute, I love birds but I have cats. If there were birds in the house, it would send my cats over the edge. I also like your blue ceiling, it adds so much to the room. We went to Lake Ouchita in Hot Springs but we live in Northwest Arkansas and go to Beaver Lake a lot too. What lake does your mom live by? Oh no! I went back to your etsy shop and the crown tassel is sold already! I was too slow! If you're going to make another one, would you let me know? Very cute can't wait to see more pictures of those babies! How very sweet of you to take the entire family! What pretty little things they are, too. I'm having a tea party today along with many others. Stop in for a cuppa. Tweet! What sweet little birds, good luck with your little brood. Hi again, Susie, to come to my tea party and the first one! I'm so honored. Hope you had a great time and thank you for your sweet comments. Have fun and eat lots of goodies! Now, that is too exciting. I can't wait to see if you get babies. How precious! But what a surprise!! Now you are going to have to buy them a bigger home!!! LOL!! Oh and I LOVE your new black table and your back yard!! It seems so peaceful back there. What a retreat. 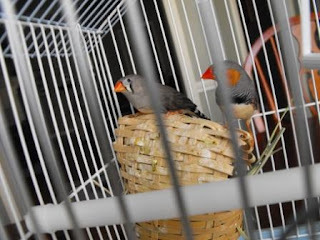 Oh - my sister in law has finches - and an outdoor aviary to keep them in because they love to have babies - as you are finding out! They moved from the cute vintage birdcage to the aviary outside! Good thing you have lots of outdoor room! Aahhh. You are a kind person to not separate the pair. I'm sure they are loving their new home!